Winners of the 2017 MWIJF Recording Prize, Lijuka return to The Jazzlab to celebrate the release of their debut single ‘Registaan’. The trio will be playing a selection of original songs featuring acoustic and electronic sounds combined with live-looping. They will be playing songs from their recent audio-visual work ‘Macro/Microcosm’ which debuted at the Melbourne Fringe Festival, along with tunes from their back-catalogue. Lijuka would like to thank Myles Mumford (Rolling Stock Recording Rooms), and MWIJF for making this event possible. Girls Do Jazz is a jazz ensemble comprised of current Jazz & Improvisation students at the Victorian College of the Arts. The ensemble is led by Andrea Keller, Lecturer in Jazz & Improvisation at the VCA/MCM. 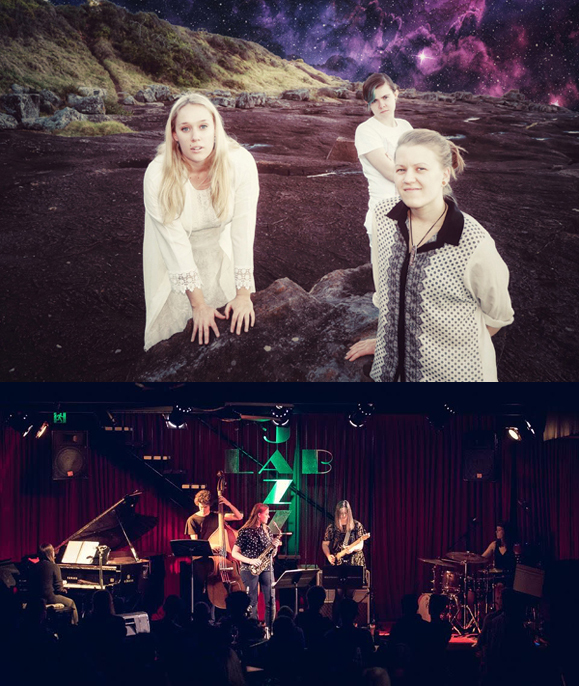 From varied musical backgrounds, the members of Girls Do Jazz unite in celebration of female musicianship, with an emphasis on Australian contemporary jazz repertoire.